For the last month I've been in pre-production on a big project... a large creature suit that combines both direct puppeteering and animatronic components. 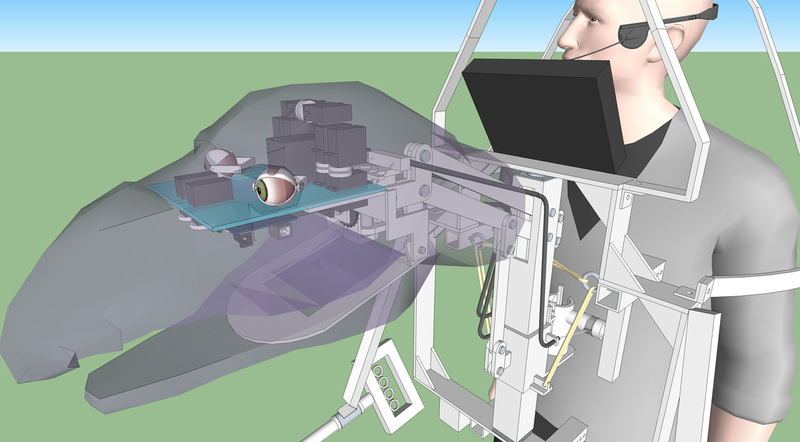 I've been hard at work creating virtual prototypes of all the components, and I am nearing a final design. As the dust is starting to settle it would seem that this is a good time to share a bit of a teaser for the project. For most of my big projects I try and build things virtually first, as I find this has a lot of benefits. Different scales, configurations, and measurements can be explored, moving parts and assemblies can be tested for restriction or range of motion, final assemblies can be broken down to test fit into the volume of a specific case for transportation/storage (or doorways), expensive materials are not wasted exploring and prototyping multiple concepts, precise blueprints can be generated for machining components, and a bill of materials can be generated which not only helps in sourcing parts but in budgeting. Building the character around a three dimensional human form is also extremely important. This helps me determine the scale of specific components like the head and arms so the final character will have the right silhouette and proportions when worn by a performer. 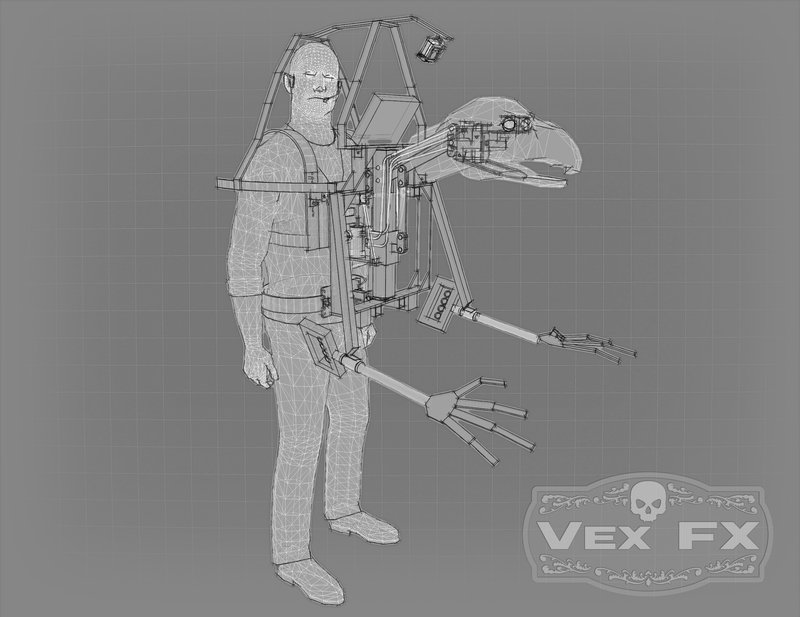 This also helps determine how much room and range of motion the performer will have in addition to allowing me to incorporate features for performer safety and comfort such as; ventilation, assisted vision, and quick disconnect points allowing the performer to separate from the character (without assistance) while still wearing their harness. Another benefit of virtually prototyping the full character assembly is that it makes splitting up the work into multiple departments possible. As the scale and dimension of the head and arms are known, sculpting of those components can begin even as the body design is refined for weight/performance/etc. Identifying and reducing roadblocks and dependencies ahead of time is priceless. One of the fun aspects of this project is the variety of materials and methodologies that will be used. The character's head and hands will be sculpted, molded, and cast in either silicone or foam latex. The main body structure will be lightweight aluminum that will be welded, riveted, articulated, and bolted where appropriate. The neck and head assembly is a complex series of linkages with direct, rod, and cable control mechanisms. 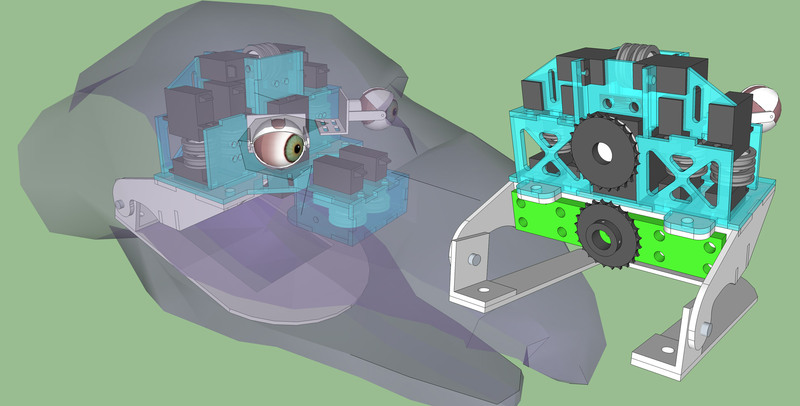 The head will contain a number of high torque servos controlling head roll, brow, snarl, blinks, and eye movement. 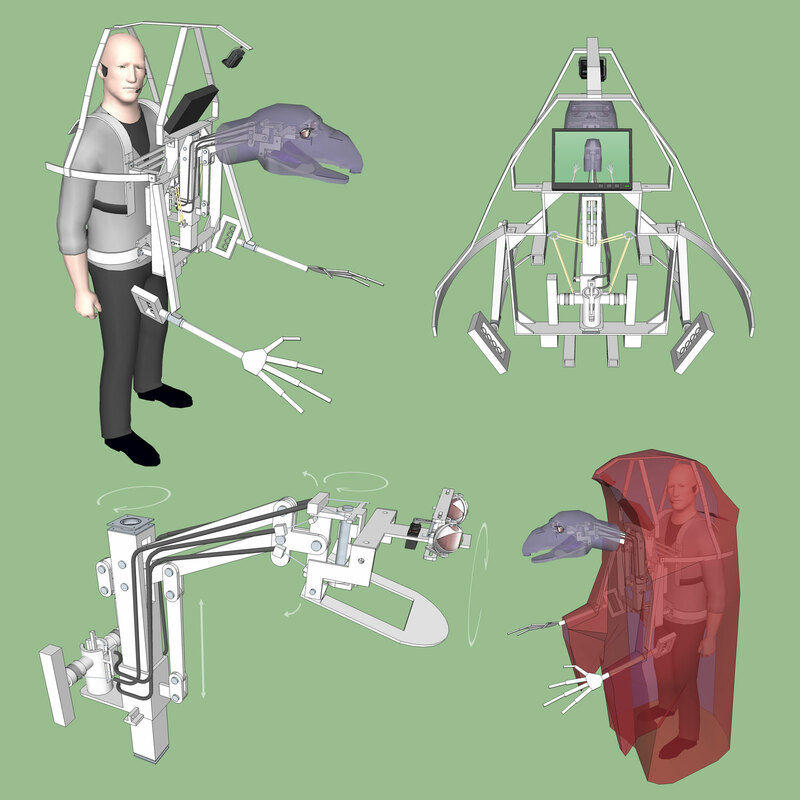 Servos will be controlled by a microcontroller running custom code to allow for lifelike movement even when not being directly controlled by a puppeteer. (for display or "keep alive" scenarios) And the wardrobe will be a combination of fabric work, beading, leatherwork, and foam fabrication. Thankfully this project has no immediate deadline, so we have the luxury of taking our time on each phase of this ambitious project. Once I'm finished with the next phase of testing and the design is a bit more refined I'll release some more detailed images. Quick project update. This new image shows the project in greater detail. I'm in the process of converting these blueprints from SketchUp to SolidWorks which will allow me to test the range of motion in the various linkages as well as the forces involved. Should be able to provide some videos of that in the near future. Also stocking up on clay to begin sculpting the head. Just left a comment on your plague mask. Didn't realize you were working on an ACTUAL Skeksis. Very awesome! Haha, yeah, there is a real bird theme going on in my shop at the moment. Completely unintentional! Quick update on the project. I've started the process of 3D printing a temporary head form. 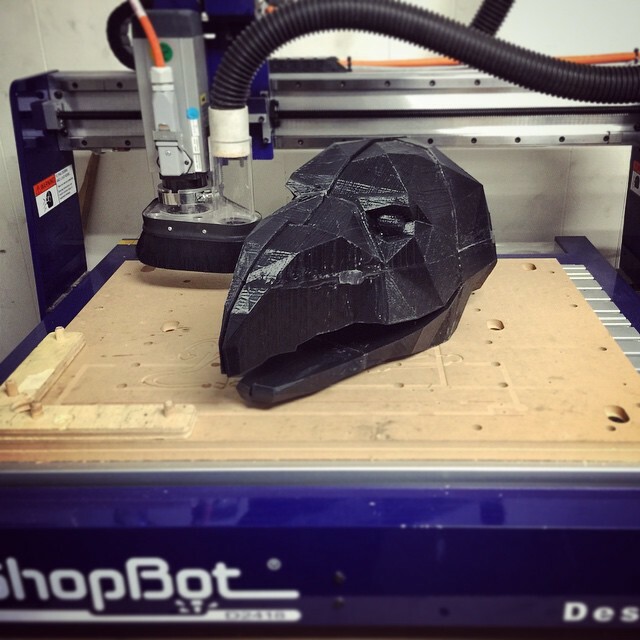 This printed head will play a few key roles in the project. It will allow me to visualize the scale of the character in the real world, as until now everything is being designed and prototyped digitally. Thankfully it's looking like the scale of the head has the right impact. It will serve as a measurement reference while sculpting the real head. While the printed head is low detail, it is dimensionally accurate in some key areas. 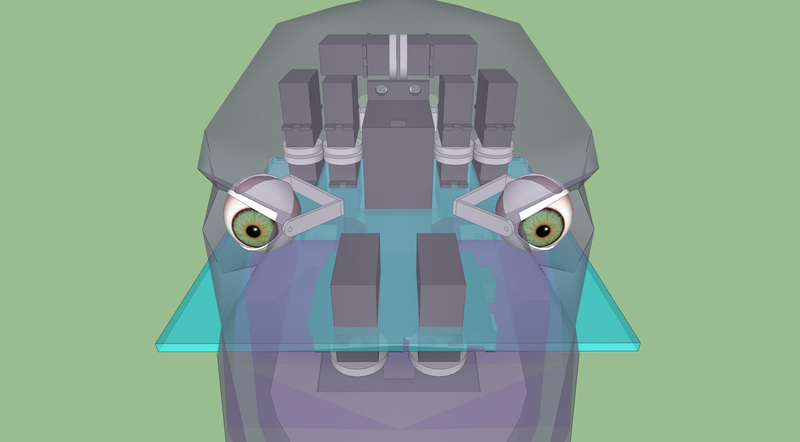 It will help with constructing the mechanical components for the head/neck by serving as a temporary head. This way I don't have to wait until sculpting/molding/casting are finished to work on mechanics. A print of this scale using consumer grade printers is certainly a challenge. The head model has been broken into 16 piece (8 left, 8 right) to fit on the print bed. Each piece takes between 4 and 6 hours to print, and prints occasionally fail. Once the second half is printed I will epoxy all the pieces together and move on to the next phase of the project. It's nice to finally have part of this project in the real world! This is an awesome project. Is the head controlled from the inside too? Also, is the head mechanical, or servo controlled? The final silicone head will be cable controlled for up/down and left/right movement, but the roll (left/right tilt) and all facial features will be controlled with servos. The jaw movement will more than likely be cable operated as well. Second half of the head is now printed (started the last piece last night, and have not seen it yet but it should be done!). Next step will be vacuum forming each half to create a light form for use while building the head and neck mechanisms. 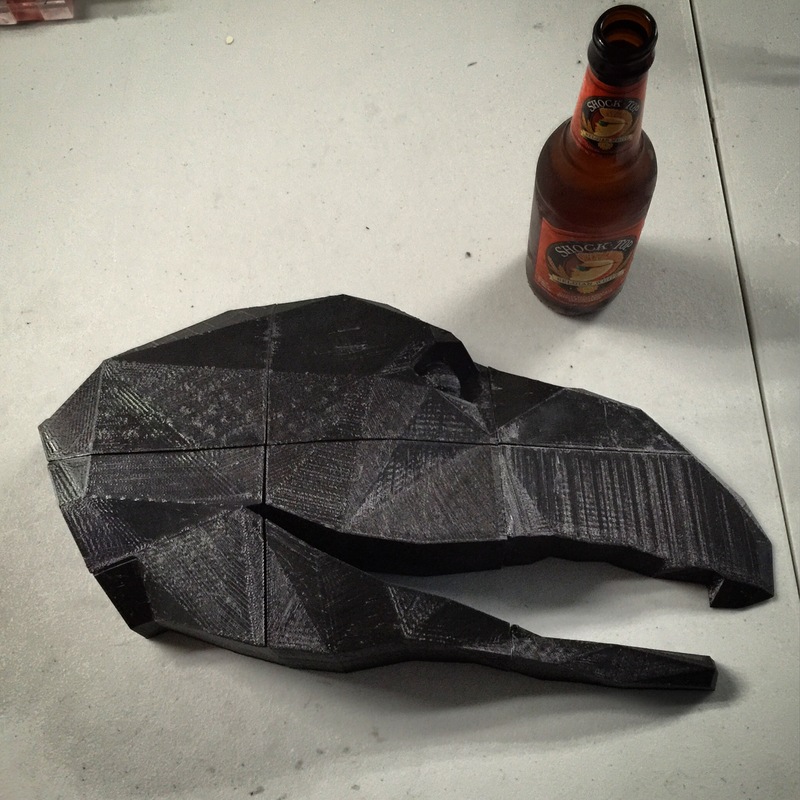 All 16 pieces of the head (averaging between 4 and 9 hours each) have been printed! I've epoxied each half together, and they are now ready for vacuum forming! A couple of things you can consider. One - you can get small camera's like they mount in cars and put them in the actual eyes of the character. That way you get a more defined view from it's viewpoint. Also - you can get video goggles and wear them. It be akin to having a TV screen floating infront of your vision. Lion of the Sun video on a built in camera system for wolf costume. This character's head moves around a great deal (big swooping movements) which would make seeing from its perspective a bit disorienting. In this case I'd rather have a single wide angle lens further back so I can see where the head and arms are at all times, so I don't accidentally collide with anything (like people) I'm clumsy enough on my own so I'm sure I'll be down right dangerous in this. Thankfully I'll have a handler to help out as well. The cameras might not work with the acrylic eyes I'll be creating, as they would not have much of a opening, and would be animatronic (looking around and blinking). The goggles are a great idea, and probably consume less power than the 7" HD monitor I have. And, to be quite honest, I kinda just want to play with a pair of video goggles! If you really want to have fun - like in the video, you take 2 goggles and merge them together to give a true stereo vision system. I've been looking into video goggles/glasses, but sadly I can't find many models that are true 1080p (or even 720p). Many boast about being 1080p and throw the word HD around, but are technically only 1080p compatible, with their true native resolution only slightly more than NTSC. And the higher end ones that are 1080p (only found a couple like the oculus rift) also have a lot of bulky head tracking features that I will not need for most projects. The search continues! Now that I've determined through 3D printing that the digital mockup of the head is a good size in the real world, it's time to start planning potential servo placement. While the head is far from small, I'll be cramming at least 13 (possibly 14) servos in there. 2 servos up top for brow movement, 4 for each eye (top lid, bottom lid, up/down, left/right), 2 for lip snarl, and 1 for head tilt (roll). I've gone through about 6 total configurations of servo placement, and the layout I'm at now seems pretty compact and easy to link up. Having every component down to the servos and micro controllers accurately modeled to scale helps greatly when optimizing component distribution. For larger movements requiring more power I'm using HS-815BB servos, which are very large, and very powerful. In the picture below you can see that it is around twice the size of a standard servo, and significantly larger (nearly 4x) than the micro servos in my mockup. I chose this servo because I have a couple spares from another project, and it should work great where more power is needed. I plan to use one for head tilt, and possibly another for jaw movement if I am not able to cable control that manually. At 6v the HS-815BB can lift 21.4 pounds at a distance of 1 inch from the servo axel. For the head tilt movement it will be linked to a large sprocket, giving it even more power. Because the servo is so fast this gear ratio will slow down and smooth out larger movements to something that will match this character's needs. The extra power from the gear ratio also means the servo will strain less when doing quick direction changes. This means fast bird-like twitchy head tilts will be easy, even with a heavier silicone skin. The blue plate in the picture will eventually be trimmed down to fit inside the head once I'm certain the servo placement is final. All electronics (and the eye mechs) will mount to this plate so they can be easily removed from the head for testing/maintenance. Removal will just require taking out 4 bolts, unlinking the chain from for head tilt, and releasing the cables for the brows (2) and the lip snarls (2). I will also be 3D printing custom brackets/housings for all servo clusters, allowing them to be stacked and positioned as desired on the main plate. The electronics package will be an Arduino micro controller and PWM shield that will allow for control and 6v power distribution to up to 16 servos. The power pack will be external (either on the neck or inside the body) to reduce head weight. Thanks for following the updates, and your ideas and suggestions are totally welcome here! The advantage is that you get ton's of power, plus you can reuse a dead servo. 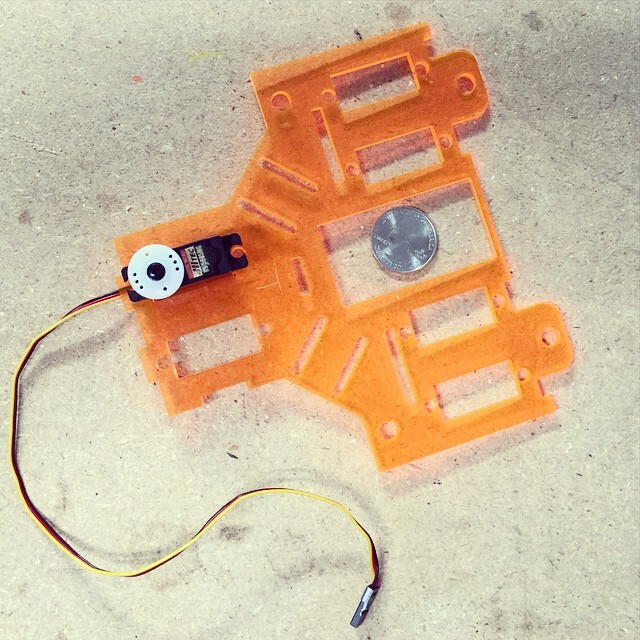 That's a clever way of using a servo's potentiometer to control a motor. 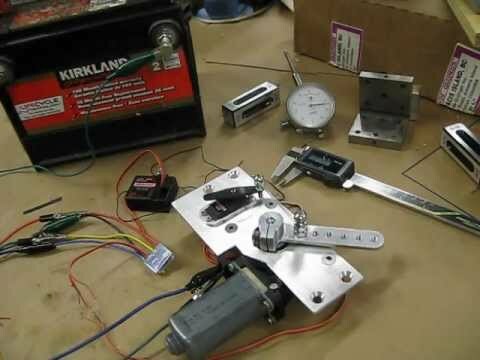 I've seen some very large custom servos like this in the past, lot of fun! I did an experiment for a facial waldo.. Precision pot's were horribly expensive especially linear ones. When I finally got some I found that pressure needed to move them was far above say the pressure a lip can give. However I did have some very cheap 9gram servos that I got in bulk from eBay. So stripping the motors and most of the gears out of them and putting in a longer horn - I have a 'linear' style servo that almost moved when one breathed on it. Was very easy to do the prototype waldo then. Facial tracking is such an interesting subject that I'm going to open a new thread to discuss it. I have an idea for a cheap system that could work pretty well for some applications. It's something that I have a keen interest in, and a lot of idea's. I have been working on several variations for over a year now and may have some valuable input. 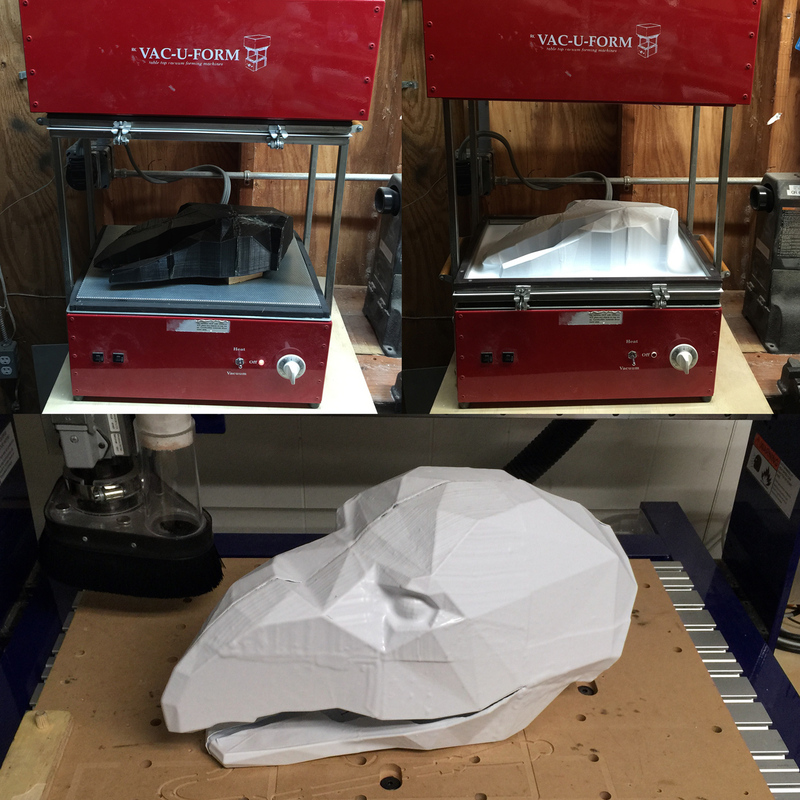 This weekend I fired up the vacuum form machine and ran a few pulls over the 3D printed head halves to create a lightweight version of the head mockup. As you can see in the picture below, the head is almost too large for the platen on this machine, but I was able to get it to work pretty well. Nice work and *sighs* nice machines too. Actually Chris - do you want to start a thread so that people can throw up a picture of their workshop so that others can get idea's re layouts etc. Great idea, I'll setup that thread now! Last week my order of servos arrived, so I was able to make a more accurate 3D model. With an accurate servo model I was able to design a servo pulley that will allow these micro servos to operate push/pull cables. 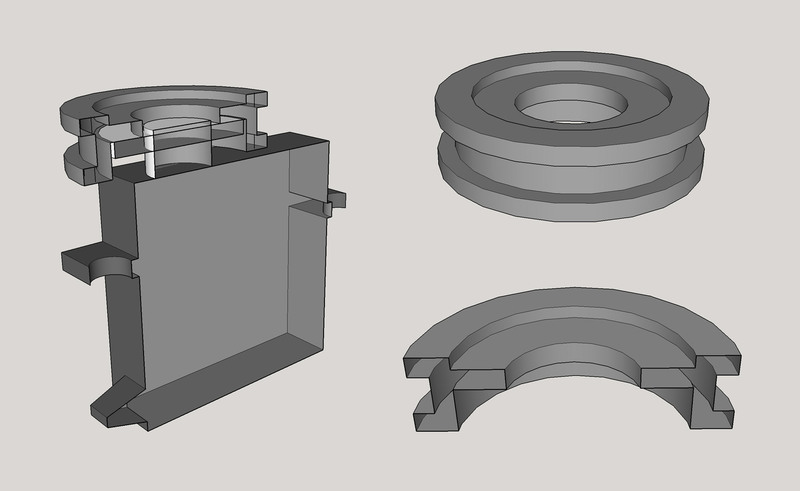 The final servo pulleys will either be cast in resin or ideally lathed/milled out of aluminum. With the new accurate servo and pulley models I was finally able to refine the servo layout inside the character's head and move forward with designing the housings for everything. The light blue material will be a lightweight 1/8" acrylic or similar plastic material. It's designed to be laser cut and assembled with glue (chemical weld) where permanent bonds are needed, and bolted together where access is needed. The white material will be another 1/8" sheet (possibly different composition/color) that is also a flat-pack laser cut assembly. The green material is a thicker 1/4" material that will attach the head assembly to the neck assembly. 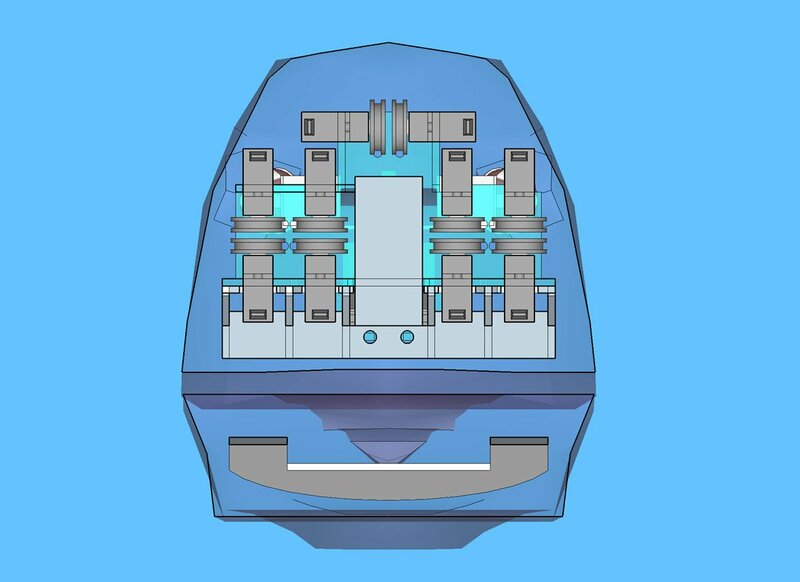 By designing digitally and laser cutting all the pieces I can be assured everything will fit in the final head (within reasonable tolerances) and assemble cleanly. As I'm modeling the components I'm testing the assembly process to look for possible weak spots, areas where assemblies might bind/collide during assembly, etc. 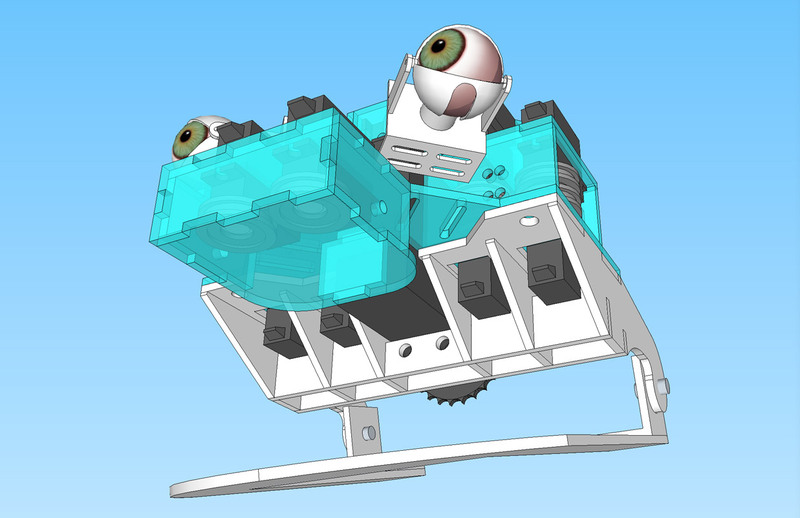 The entire blue mechanical assembly (containing the eyes, all servos, and microcontrollers) can be removed for construction/testing/maintenance. This means I can work on the animatronic components prior to having a finished head sculpt/skin/underskull/etc.. This design securely holds all 13 servos in as compact a configuration as I have been able to find. You can get a better idea of how densely packed everything is in the sliced image below. This configuration allows for a 1/8" gap between all servo pulleys. If all goes well I should be able to start laser cutting parts in the next week or so. I often use cut up PVC pipes like they use in general pluming. With a heat gun it's easy to flatten it out and then cut it to shape. If folds are needed then the heat gun can be used again. With the pullets - I sometimes cut 3 disks of acrylic or PVC (2 large and one small) and sandwich the smaller one between the two larger one. Makes a great pulley and it's easy to adapt an existing horn for driving it. First test piece was cut on the laser last night. To my surprise, everything fits! Seeing it for the first time in the real world also reminds me how compact this entire assembly is. It feels so much larger when I can zoom in with CAD. This means I can move forward with the rest of the flat-pack style design knowing I'm not painting myself into a corner. That looks great. What thickness of acrylic are you using. And tell us about your laser set-up too. While I'm using 1/8" acrylic, it's never actually exactly .125"
There are 2 main types of acrylic sheet material, cast, and extruded. Extruded is pushed through a dye and is notoriously inaccurate as the thickness will change as it settles, and can vary from manufacturer to manufacturer. Cast is more accurate, but for some reason (from what I've been told) it does not laser cut as nicely. With the flat-pack construction method I'm using, having a predictable thickness is important so all tabs fit into their intended slots with as little wiggle room as possible. 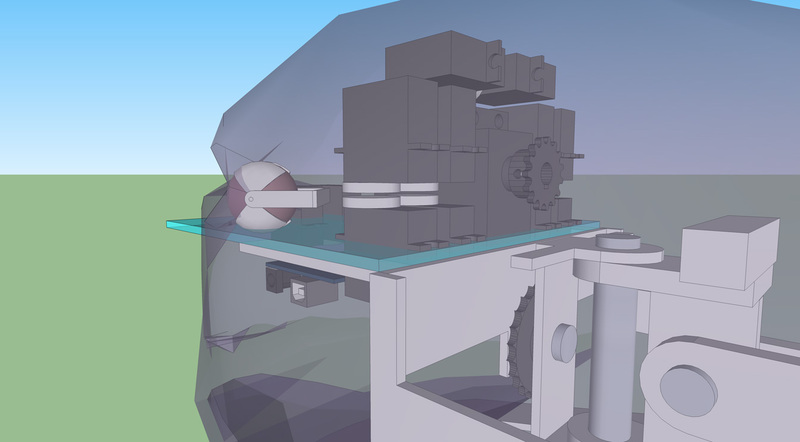 When I move on to cut the final parts I'll try and source the most even pieces of acrylic that I can, and insure they are as close to .125" as possible, and then adjust my CAD models to the proper tolerances for the selected material. The laser cutter I'm using is an Epilog 45w. The wattage rating determines the types and thicknesses of material it can cut. 45w is pretty good for most applications. The printing process is a little complicated, primarily because Sketchup (the CAD application I'm using) decided to only allow proper vector exporting in the pro version. To get around this issue the following process. Change the camera mode to "Parallel Projection"
Printing to a PDF generates proper vector outlines of all my components, which gets around the lack of vector exporting in Sketchup. After that I open the PDF in Adobe Illustrator, select the square I made in step 3 along with all the parts contained inside it, and scale that square to the proper size, in this example 10.1234"
Then it's just a matter of setting up the material properties and starting the cuts. I've heard some good things regarding this free package. You do have to register it but I have had no issue re bogus software offers. I'm updating to version 2 so I can give some feedback re vector export.